Xeroderma pigmentosum (XP) is an autosomal recessive disorder of DNA repair mechanism that results in damaging effects on sun-exposed parts of the body.,, A review of 100 patients with XP revealed that they never received vitamin D supplementation, although they had consulted dermatologists, physicians, and pediatricians in the past. It was also observed that many in their adulthood had short statures and were noticeably shorter than their unaffected parents. We evaluated and compared stature of XP patients with age-matched normal Indian population obtained from literature. Further, we studied serum vitamin D levels in 14 patients including children <18 years. Vitamin D levels were evaluated using chemiluminescence assay (levels <10 and 10–20 ng/ml were reported as vitamin D deficiency and vitamin D insufficiency, respectively). Stature of 31 adult patients [median age 28 years (interquartile range, 23–31 years)] was examined by internists. Nineteen were males (61.3%). Both males and females were significantly shorter when compared with age-matched normal population [Table 1]. Mean height deficits in males and females were 6.7 and 5.9 cm, respectively, and were independent of age (P = 0.81 and P = 0.13, respectively, Spearman correlation). Per a simpler classification, 73.7% of males and 75% of females were shorter, whereas Hadj-Rabia et al. showed ~52%. Median serum vitamin D3 was 8.65 ng/ml (interquartile range, 7.37–10.81 ng/ml). None of the patients had vitamin D supplementation at presentation or before. The study reveals that patients with XP have shorter statures and are vitamin D deficient. Although specific factors contributing to a stunted growth cannot be investigated, it is presumed that a vitamin D deficiency during growth period could be attributed to the failure of attaining a normal stature. Since XP patients visit a dermatologist, ophthalmologist, pediatrician, or physician based upon their initial complaints, it is important to sensitize all healthcare providers about the need for vitamin D supplementation in the routine care and follow-up of these patients. Chaurasia S, Mulay K, Ramappa M, Sangwan V, Murthy S, Nair R, et al. Corneal changes in xeroderma pigmentosum: A clinicopathologic report. Am J Ophthalmol 2014;157:495-500.e2. Mohamed A, Peguda R, Ramappa M, Ali MJ, Chaurasia S. Corneal endothelium in xeroderma pigmentosum: Clinical specular microscopy study. Br J Ophthalmol 2016;100:750-3. Sevel D. Xeroderma pigmentosum with ocular complications. Br J Ophthalmol 1963;47:687-9. Som S, Ulijaszek S, Pal M, Bharati S, Bharati P. Variation in height and BMI of adult Indians. J Biosoc Sci 2014;46:47-65. Hadj-Rabia S, Oriot D, Soufir N, Dufresne H, Bourrat E, Mallet S, et al. 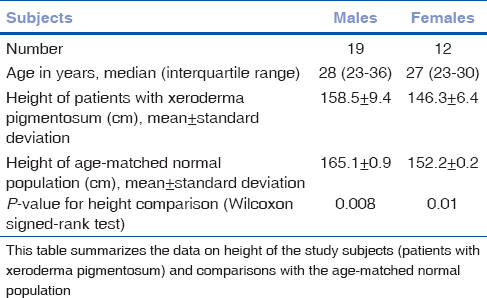 Unexpected extradermatological findings in 31 patients with xeroderma pigmentosum type C. Br J Dermatol 2013;168:1109-13.